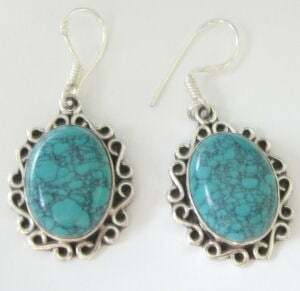 These are a gorgeous pair of drop earrings made up with lovely large blue turquoise stones with a nice amount of natural veining. These lovely nice large turquoise stones measuring approx 18mm x 12mm with lovely light grey veining. The silver around the turquoises has a pretty S shape design. The pretty design is very flattering and girlie and would suit all ladies of all ages.